I have more than just easy cheesecake recipes from scratch, check out more delicious recipes at the end of the page. These homemade cheesecake recipes create heaven on a fork. Creamy and rich with delicious toppings. Homemade caramel, chocolate and fruit toppings make a huge difference. This easy cheesecake recipe was a grand prize winner and is adapted from the Wisconsin State Journal. You will need 3 lemons for this easy cheesecake recipe. One will be sliced thinly and the other two will be used for 1 teaspoon of lemon zest and juiced. For the crust, combine the crumbs, butter and 1/3 cup of sugar. Pat into the bottom and sides of a 9 inch springform pan. Bake for 5 minutes and cool. For two of the lemons, grate them to yield 1 teaspoon of zest and squeeze both of them for juice. Set aside until needed. For Layer 1, beat softened cream cheese on high for one or two minutes until completely smooth. Add eggs, one at a time, mixing well after each addition. While beating, add 1-1/3 cups of white sugar, 3 TBS lemon juice and 1 tsp of vanilla. Stir in 1 tsp zested lemon peel. Pour into cooled crust and bake for 35 minutes. For Layer 2, blend sour cream with 3 TBS sugar and 1 tsp vanilla. Set in a warm place to remain soft for spreading. Remove cake from oven and gently spoon sour cream mixture over top of cake. Return to the oven and bake for 12 minutes. Refrigerate until topping is cool, not completely set before adding lemon glaze. For the 3rd lemon, slice into paper-thin cartwheels, removing seeds. Reserve 5 or 6 for garnish and coarsely chop remaining slices - place in a pan with 2 cups of water. Bring to a boil; simmer uncovered 15 minutes. Strain, saving 1 cup juice and discarding the rest with the pulp. Combine 1 cup sugar, cornstarch, 1 cup juice and 1 cup water; stir until smooth. Bring this to a boil, stirring constantly. Cook mixture for 3 minutes and add food coloring. Chill until cool, but not set. Spoon glaze on top of cheesecake carefully. Garnish with the remaining cartwheels. Chill several hours or overnight before removing from pan. 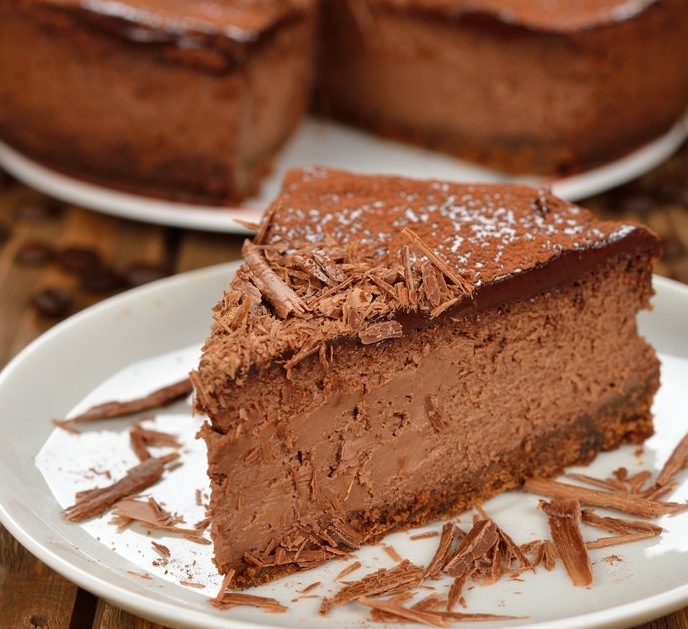 More easy cheesecake recipes below. PRE-BAKE THE CRUST - Most cheesecakes sit in or on a crumb crust. Although the crust will bake with the cake, don't skip the quick 10 minute pre-baking - it's what gives the crumbs their nice crunch. For the best results, mix the ingredients for the crust, pat them into the pan and slide the pan into the freezer while you preheat the oven. MIX LIKE MAD - So that the finished cake has the flawlessly smooth texture that is the hallmark of a great cheesecake; a completely smooth batter. Whether you are working with a mixer or a food processor, make sure to blend the batter until it is not just lump-free but satiny - any lumps in the batter will NOT disappear during baking. COOL THE CAKE - When learning how to make a cheesecake - Never rush it to the table. Cooling and then chilling it is as important a step in its preparation as baking it. UNMOLD THE CAKE WITH CARE - It's not exactly brain surgery, but removing the sides of the spring form can be a delicate operation. My preferred method is to run a blunt knife around the cake and then to warm the sides of the pan with a hairdryer. Using a hairdryer beats dunking the pan into a sink-full of warm water - no seeps, no drips - and you have lots more control. If the sides of the cake have softened a tad during the heat spell, smooth them with an icing spatula and chill the cake briefly before serving. I have more than just easy cheesecake recipes, check out my dessert recipes at the link below.